If you would like to display a form as popup layer or exit popup then go to "Display in Popup layer" section of the form review page. Auto open: the popup layer will open automatically when the page is loaded. 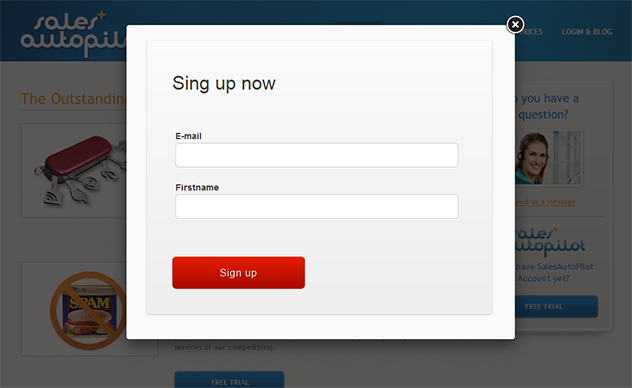 If the visitor has already signed up through this form or closed it without signup, it won't appear again. Exit popup: the popup layer appears if the visitor has spent at least 5 seconds on the page and pulls the mouse pointer across the upper 5 pixels of the page. Visitors usually do this when they are about to navigate away from a page. So, this is a good opportunity to catch their attention with a question or an offer. Opener button: if you insert this code a signup button will appear on your website. When a visitor clicks on it the popup layer is displayed. 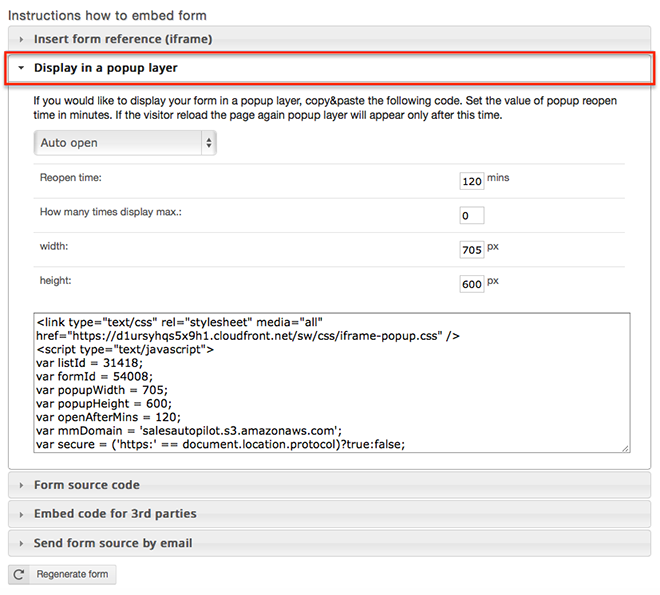 Choose this solution if you don't want to display the form directly to your visitors. Reopen time: if the visitor closes the popup layer without signup this value defines how many minutes have to pass until it opens again. Width: width of the popup layer. You have to change it if you use a narrower form or a custom form layout. Height: height of the popup layer. It's recommended to adjust it to the height of the form. If the form overrides the layer a scrollbar will automatically appear. The source code of the popup layer will be automatically adjusted for the settings above. Copy the source code from the text area and paste it into your webpage or CMS. It's recommended to copy the code before the </body> tag.